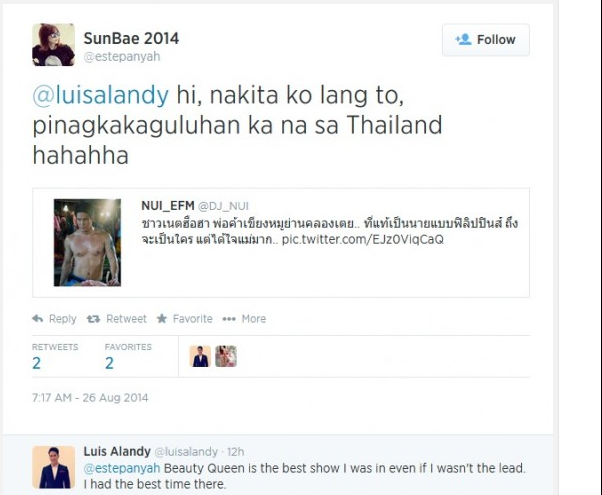 Filipino actor Luis Alandy or Adrian Louis Alandy in real life, made rounds on social network. The photo shows Luis posing as a butcher at a local market, wearing only what appears to be blue shorts with a butcher belt wrapped around his waist. The photo was first posted by Facebook user Golfsuda Nam and was shared thousands of times hours later. People started commenting as to where the market was because they’re going to buy whatever he was selling. The popularity of the photo made a spot in a Thai news channel. The anchors revealed that the guy Thai people thought was Thai was actually Filipino actor Luis Alandy, a model and actor from the Philippines.